Q: Why did you decide to get tattooed? A: I first knew that I wanted to get tattooed when I was just a teenager. I was at Disneyland and saw a girl with a Cheshire Cat tattoo on her back. I thought it was the most beautiful thing I had ever seen. I decided that day that I wanted to have tattoos someday on my own skin, but I did not start getting tattooed until I was almost 30 years-old and was really confident with myself and my life and was certain that I wanted to be a tattooed woman. Q: How old were you when you got your first tattoo? A: I got my first tattoo when I was almost 30 years-old and it was a little cherry on my ankle. Once I got it, I never looked back and continued to get tattooed on a regular basis from that point on. Q: Did you have full support from your family and friends? A: My husband and children love my tattoos and totally support me, as do my friends. I guess I wouldn’t really be friends with anyone who was bothered by my ink. My parents were a little confused when I started getting tattoos and didn’t really understand why I wanted to have them. But over the years, my mom has become very supportive of me and my art. My sister, her husband and my brother are also supportive. My brother-in-law and brother have quite a few tattoos themselves. Q: How does this affect to your professional life? A: I have been very lucky to not have any issues with this because for the last 12 years I have owned my own online collectibles business (http://stores.ebay.com/mermaidink). I am my own boss and luckily don’t have anyone telling me how I need to look or what to wear. Since I sell everything online, most of my customers don’t even know what I look like, as I pack and ship everything out of my home office to all parts of the world. I started my business right before I started getting tattooed, so it all kind of fell into place. I am also a freelance writer and have written for many magazines and newspapers. Last year, I co-wrote and edited my first book with Mike DeVries called Let’s Be Realistic. I just finished the second book with Mike that will be out later this year, called Tattoo Prodigies. I also write and blog every day on my website (www.JinxiBoo.com) about tattoos, being a mom, vegan cooking and baking, inspirational stories and much more. Q: How many artists have worked on your body over the years? A: Over a dozen artists have tattooed me over the years. I have almost 400 hours of tattoo work on my body and about 185 of those hours are with Mike DeVries. I have several artists whose work I really admire and have not collected from yet, who I plan to save spots for. I don’t plan to stop until I run out of skin, which, unfortunately is happening faster and faster, it seems. Q: Do you have a favorite tattoo on yourself? A: Oh gosh, this is a hard one because I have so many that I love. All of the portraits of my family: my husband Steve; and one each of all three of my children: Brynn, Shea, and Aidan - all mean so much to me. But besides those portraits which I love for sentimental reasons, I think my favorite is the octopus on my throat/chest. The octopus tattoo took 26 hours (6 sessions) to complete and was just incredible to watch it come to life. It was also the first tattoo that Mike DeVries did for me and that began a great part of my tattoo journey when I started collecting his work. Q: Would you say that your tattoos speak about your personality? A: Yes, they definitely do. I tattoo what I love, so it really encompasses me and my journey through life. Some are very sentimental, like the portraits of my family; while others are just things I love, like song lyrics, cartoon characters, words that are special to me, or cupcakes and candy. I also think that my tattoos speak about issues that matter to me and statements that I want to convey to the world. I figure if you are going to wear art for the rest of your life, you better REALLY like what you choose to put there, be prepared for people to ask you about it, and be proud of the beautiful ink that you acquire. Q: Is there anything you regret? A: I am very happy with the tattoo collection that I have so far. I know it might sound hard to believe, but I do NOT regret any of my tattoos. Even some that I got a long time ago, that are not necessarily the best work, those still mean a lot to me because they remind me of that time in my life when I received them and that is a part of my entire journey through life. Each one tells a story in its special little way and in turn, that tells MY story, so I just couldn’t regret any of them. I treasure them all. Q: What is the most painful place to get tattooed? A: I know that this varies for everyone, but for me, the most painful place to get tattooed so far was on my head. It is a very tender area and it bleeds a lot. I also had two artists (Mike DeMasi and Mike DeVries) tattooing my head at the same time. There was one artist (one Mike) on each side, while I laid down on a table with my head faced down for part of the tattoo and then laid back in a chair so they could to the areas around my hairline for the other part of the tattoo. Having two tattoo machines going at the same time on my head was really painful. We are not finished with my head project yet and still have a few more sittings to go, but even when it hurts, it is always worth it in the end. Q: Your tattoos are awesome. What is the best way to choose the right artist? But the short answer is that I think it is really important to take the time to find an artist who really understands your vision for your tattoo ideas. There are so many great artists in the tattoo industry, but making sure that they really match up with your style and the dream you have for your tattoo collection is so important. It is also really worth noting that getting a tattoo is not the best time to look for a bargain. You usually get what you pay for when it comes to tattoo work and since you are going to wear your ink forever, it is worth saving up for if you need to, to make sure that you get excellent work from a safe, clean shop. Q: Do you feel that women have been under-represented in the tattoo world? A: I think that respect for women is starting to come around, but in the scope of the tattoo industry, there are not as many tattooed women as there are tattooed men, so we might not be as visible in this way. Don’t get me wrong, there are a LOT of tattooed women out there. But years ago, it wasn’t as acceptable for women to be tattooed as it was for men, so we still have catching up to do (he he). More often, it seems to be society in general who does not give tattooed women an equal impression. It seems that a lot of people are even more judgmental towards heavily tattooed women than men, in a way. I don’t know if it is because they not used to seeing a woman with so many tattoos and they are used to seeing men with ink, or if they just don’t think that a woman should have tattoos, but when I am with my husband or other tattooed male friends and people seem to give us disapproving looks, I often feel that they are more shocked by me having a lot of ink than the men around me. I really think that needs to change and I work hard in my own life to try and give tattooed women a positive image. I think that the best thing you can do to try and overcome stereotypes from society that is not accustomed to tattooed people is to be kind, generous, intelligent and not ever be judgmental towards another person - in any way - because hopefully, they will see this, learn the lesson and give you the same respect. Q: Do you feel that people treat you differently because you're a woman? Are there any prejudices? A: I believe that equality is coming for women, but that we have to work extra hard to demand that it is there. 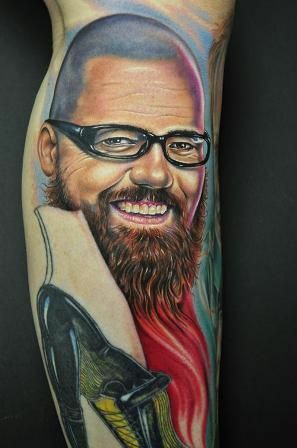 I have been very lucky in that I do feel a lot of kindness and respect from my fellow tattoo collectors and from tattoo artists in the industry. I think that is a testament to the open minds that tattooed people have over society in general. 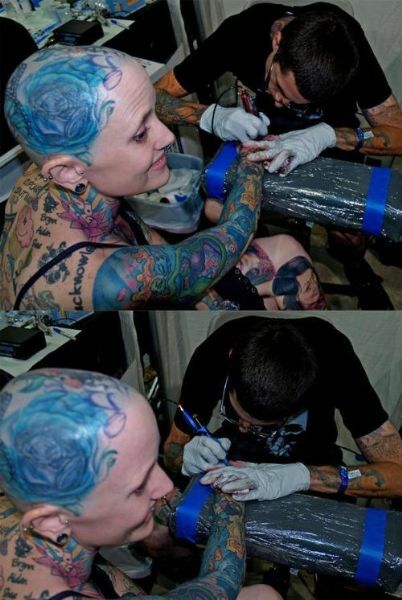 When you decide that you are going to modify your body, you sort of step into a whole other world and know that many people around you might not agree with your decision, but other tattooed and modified people understand what you are going through and are therefore more accepting, whether you are a female or male. I think that really says a lot about the character of people in the tattoo world. At least in my experience, it has been very positive in that respect. Q: How do you feel after the awesome TV show "Wife Swap"? A: Wife Swap was a really crazy and eye-opening experience. The show really found a family that was totally opposite from us, and it was a big challenge to try and make it through the two weeks of living in their home when we filmed the show. The other family did not like our tattoos or our lifestyle and our family thought that they really needed to open up and have more fun in life. The show did portray many parts of our life and how we parent our children and live our lives. Of course, as with all reality television shows, they really like to show the drama. So when the show was edited, they chose very dramatic times and scenes. My family and I really learned to appreciate each other and the lives that we have, the friends that we have, the family that we have. When you see life from such a different perspective, like the family that we swapped with, that is so close-minded and repressive, it really makes you grateful that you are surrounded by loving people who accept you for who you are and for being open-minded and diverse. Q: You are an extremely talented and creative person. Tell me something about your online collectibles? A: Thank you for the kind words. Well, when I began my online collectibles business, my husband Steve was in law school and my children were very little. I had been a proofreader before they were born and I wanted to stay at home with them, but also have a job and an income. I realized that if I could work from the computer and build up a business, that I could still be with my kids, collect my tattoos and make a living from my website. It took a lot of work and dedication to build it up and make it successful, but lucky for me, it turned out to be a great way to accomplish many of the things I had hoped to by starting it. I have been working hard on my writing career also lately. Writing has always been my passion and as much as I love having my collectibles business, I would love to be able to sit down and write for a living each day. A: Oh gosh, that is a hard one. I love writing so much, but does ANYTHING beat baking cupcakes (he he)? I love baking. I just made a huge batch of Vegan Pumpkin Oatmeal Chocolate Chip Cookies today, in fact, write before I sat down to do this interview. Q: How much time did you need to create your first tattoo book called "Let's Be Realistic"? How is the feeling to work with artist like Mike DeVries? A: Writing Let’s Be Realistic with Mike was a great experience. He is one of my best friends, so it was really easy to work together and we really understand each other well, so have the same point of view on almost everything that was included in the book. Mike has tattooed almost 200 hours of tattoo work on me, so given the time I have spent in his tattoo chair, plus the time we worked on the book, we definitely have a great appreciation and friendship. The book was a LOT of work. It took almost 8 months in its entirety; which included writing, editing, proofreading, and so much more. We were very pleased with the way it turned out. The second book, Tattoo Prodigies, will be going to the printer very soon, so watch for it later this year or early next year to be available for sale. Q: What are your feature plans? A: I like to keep busy and always have new plans and goals on the horizon. My days are full from start to finish and sometimes I just wish there were more hours in the day. I will definitely continue writing more and more on my website; about tattoos, vegan cooking and baking, my family, motherhood, music, books, activism and anything else that I am involved in. Now that the Tattoo Prodigies book is almost finished, I want to start writing my own book and will start outlining the ideas for that soon. I continue to collect cupcake art for my project, The Cupcake Continuum, which you can check out at www.CupcakeContinuum.com and I am also working on building up another website where people can share inspirational stories about their lives. Thank you for the opportunity to be featured in your magazine/website. I really appreciate it and am happy to be a part of your great project! !